Media captionTheresa May: "I'm offering to sit down with the leader of the opposition"
Mr Corbyn said he was "very happy" to meet Mrs May, and would ensure plans for a customs union and protection of workers' rights were on the table. 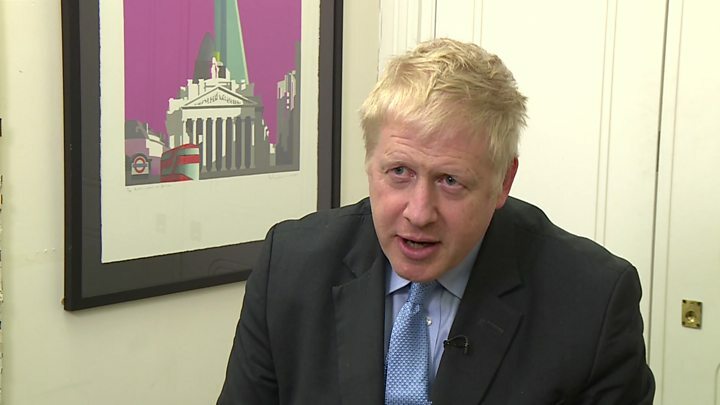 The cross-party talks offer has angered Tory Brexiteers, with Boris Johnson accusing ministers of "entrusting the final handling of Brexit to Labour". The former foreign secretary said Brexit was "becoming soft to the point of disintegration" and he could never agree with staying in a customs union. BBC political editor Laura Kuenssberg said it probably means the prime minister is likely to adopt a closer relationship with the EU - a softer Brexit - than she had agreed so far. The UK has until 12 April to propose a plan to the EU - which must be accepted by them - or it will leave without a deal. In a statement in Downing Street, Mrs May said she wanted any further extension to be "as short as possible" - before 22 May so the UK does not have to take part in European elections. She said she wanted to agree a new plan with Mr Corbyn and put it to a vote in the Commons before 10 April - when the EU will hold an emergency summit on Brexit. The BBC's Europe editor Katya Adler warned their demands "haven't changed at all", and they are preparing "pretty strict conditions" for any further delay. "Even though Theresa May says she doesn't want to, EU leaders will ask her to prepare the UK to take part in European Parliamentary elections by the end of May because they don't believe she will be able to get her Brexit house in order before then," she said. 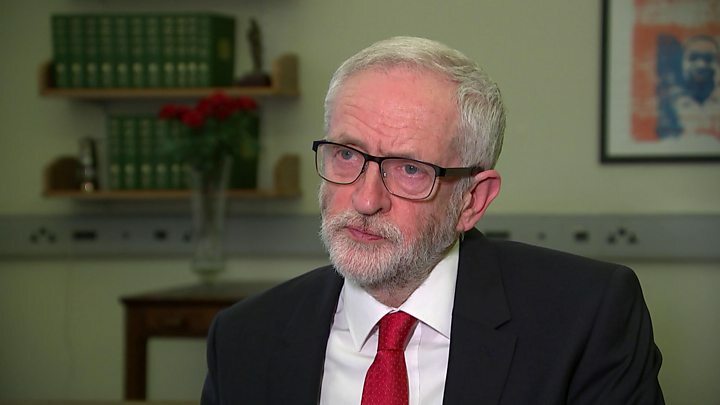 Mr Corbyn said he saw the content of the prime minister's speech only when it went out on TV, but he recognised Mrs May had "made a move" and that he had a "responsibility" to engage in the talks. Asked by the BBC if he was willing to compromise on his own red lines, he said: "I have been meeting MPs from all parties from the last couple of weeks. Yes, there is some common ground [and] there are some areas it is difficult to agree on. "But there is far more that unites people on both sides about the kind of society we can be than divides them. "We will discuss [this] with the prime minister. I don't want to set any limits one way or the other." Media captionJeremy Corbyn: "I recognise that she has made a move... I recognise my responsibility"
Laura Kuenssberg said there were differing accounts of the level of support for any extension within the cabinet - from four ministers voicing opposition to it to as many as 14 being against it. Pressed on this, Environment Secretary Michael Gove told the BBC none of the Brexiteers in cabinet were "happy at the situation we find ourselves in" and they would have preferred for Mrs May's withdrawal agreement to be passed by Parliament last week. But he said there had not been a vote on the issue in the meeting, and there was a "critical consensus" about any extension being as short as possible. The Leader of the House, Andrea Leadsom, said: "We are trying to find a way to deliver on the referendum to make sure that we leave the European Union with a good deal that enables all of those who voted to leave the EU to be satisfied, but also that protects jobs and our security. "We continue to do that and that's what cabinet today was all about". Image caption Andrea Leadsom said cabinet was "trying to find a way to deliver on the referendum". 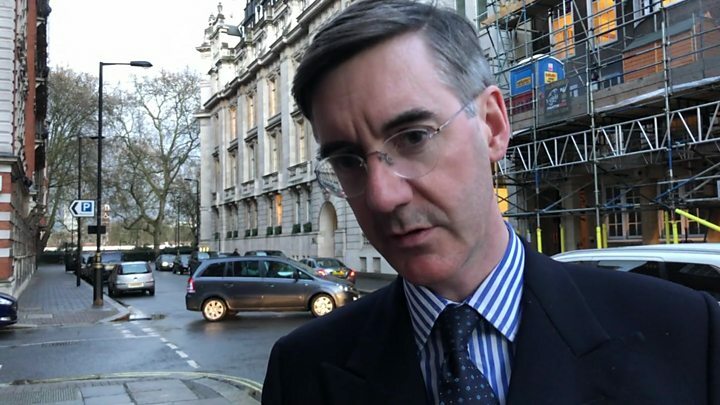 Leading Brexiteer Jacob Rees-Mogg said it was "not usually successful for governments to get their business passed on opposition votes when their own party is against it". The chairman of the pro-Brexit European Research Group added he "doubts the wisdom" of the decision, saying: "To allow the Labour party to run Brexit, to decide you'd rather be supported by a Marxist than by your own party, is unwise." Mrs May said she understood some people would prefer to leave without a deal, and she believed the UK "could make a success of no-deal in the long term". "This is a difficult time for everyone," she said. "Passions are running high on all sides of the argument, but we can and must find the compromises that will deliver what the British people voted for. Scottish First Minister Nicola Sturgeon said it was another case of the PM "kicking the can", while Lib Dem leader Sir Vince Cable questioned the point of cross-party talks. Hilary Benn, the Labour MP who chairs the Commons Brexit committee, said the PM's announcement was "good news" but she must show she was genuinely open to new ideas. But Brexit-supporting Labour MP Kate Hoey said "whatever compromise" Theresa May and Jeremy Corbyn came up with, many MPs would simply not vote for the withdrawal agreement. The Democratic Unionist Party - who give Mrs May a majority in Parliament but have repeatedly voted against her deal - said the move came as "little surprise" after the PM's "lamentable handling of the negotiations". The DUP said: "It remains to be seen if sub-contracting out the future of Brexit to Jeremy Corbyn, someone whom the Conservatives have demonised for four years, will end happily." After Mrs May's statement, the president of the European Council, Donald Tusk, called for patience. After the PM's statement, Labour's Yvette Cooper said it was "welcome", but added: "We are waiting to find out further details on how the government's proposed process will work, including how decisions will be taken about the length and purpose of an extension, and how indicative votes will work to make sure we don't just end up with no deal a bit later on."